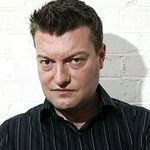 Charlie Brooker joined End Water Poverty's campaign actions at Glastonbury 2007. Google trends for "Charlie Brooker"
We don't have any news stories about Charlie Brooker. We don't have any videos related to Charlie Brooker.